Kitt's World: Happy New Year. I have blog candy! Happy New Year and welcome to Kitt's World's and my first participation in a blog hop being hosted by Artistic Inspirations Challenges. Join our fun game for a chance to win the hidden word prize. See the complete rules and prizes to be won here. I have some blog candy for you also. To be eligible for a chance to win my blog candy, you need to become a follower of my blog, leave a comment with the word CANDY somewhere in the comment and place my blinkie or button (grab the code to your right) on your blog for others to find me. I will then use random generator to choose a winner in two weeks from the qualifying comments. (Sorry I will only be able to send blog candy prize within the United States at this time). I created this snow globe in Silhouette Cameo. The child image is from Robyn's Fetish. I used sparkle white paper for the globe and Stickles diamond glitter glue on the trees. And of course I had to use my Spectrum Noir markers. With as many as I used you must think I'm trying to cut back. LOL. They were BG1,BP1 and BT3. The sentiment was computer generated and I sponged the edges of the mat with Tim Holtz tea dye distress ink and embellished it with black brads. 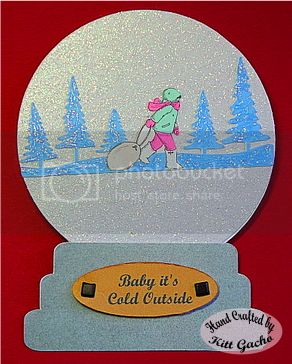 Adorable card and perfect for the weather we're having at the moment (it's in the single digits here in Tennessee). 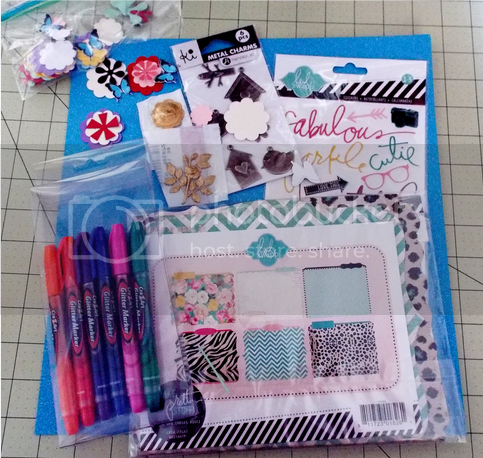 So glad you joined us for the Sparkle N Sprinkle Creative Challenge this month. Love all the pretty sparkle! Thanks for playing along with 2 Creative Chicks! What a wonderful globe. Love all the sparkle! Great card Kitt, the sparkles look really frosty and I love the globe shape. Great card - love the snow globe! Thanks for joining us at One Stitch at a Time this time and good luck! Beautiful - a very clever design. Thanks for playing with Hobbycutz this week. Hi, Kitt: Your card is perfect for this weather--even Alabama is COLD. Thanks for entering our Challenge #52 - "Anything Goes"
I love all the glitter! Thank you for playing along with us at Bugaboo! so pretty. Thanks for joining us at Die Cut Divas. Wow! Such an wonderful card! Love the snow globe shape and the wonderful sparkle of the globe, very wonderful Thanks for joining us at Lexi's Creations for our 'Anything Goes' challenge! A gorgeous snow globe christmas card thankyou for joining our challenge at Craftitude. Great project... Thanks for playing at Catch The Bug. Very elegant card. Thanks for playing at One stitch at a time. Good luck. We hope to see you next challenge. brr! Your card is certainly appropriate for this time of year! Thanks for joining us for our "Anything Goes" challenge at Yumi & Fumi Handmade! Sheena B (Team Fumi). Such a fun and creative card! Thanks for sharing with us this month. Thank you for entering our challenge at One Stitch At A Time….. good luck in the draw. We'd love it if you could join us again in our future challenges. Super cute card! I can feel the cold lol Love the shape of the snowglobe! Great creation, thanks for joining us at OCS. It's really cold outside, this card is so frosty! Lovely shape, very creative. Thank you for joining our challenge at Pile It On and I hope you will come back again. Beautiful snow globe. Love how it sparkles! Thanks for joining us at Crafting By Designs month long Anything Goes Challenge. Love all the sparkles and cute winter scene, sweet snow globe.